My son, when he is near certain people, for a length of time, begins to pick of the accent of the person, to whom he is speaking. If he is with southerners, suddenly he is speaking with a southern accent. If he is with Midwesterners, he begins to have that accent. My eyes open with wonder, when he does this, and he is totally oblivious of his accent changing. It is easy to begin to emulate whatever is filling our minds. It’s easy to pick up foul words, when we are constantly surrounded by that. It’s easy to act judgmental when the newscasters we watch daily are judgmental. It’s easy to gripe and complain when we are surrounded by these attitudes. It’s easy to start gossiping when we are surrounded by gossip. It’s easy to seek revenge, just like in the movies, or books we read. We pick up these actions, and sometimes are totally unaware of what we are doing. When we are in Christ, we are a new creation. We, on our daily Christian walk, are adjusting our attitudes and actions to imitate our Heavenly Father, though Jesus Christ. It’s a daily battle of ridding ourselves of selfish desires, to filling ourselves with the love of Christ. Jesus came as the Prince of Peace, and we likewise, are to be an example of Him. When we look at these scriptures in Philippians, we see a focus shift that should become a dominant factor as we work on our salvation. Salvation is a gift, free and clear, but walking in that salvation takes work on our part. What does our fruit look like? Is it nice and ripe, and pleasing to the eye, or is it a little less than desirable? 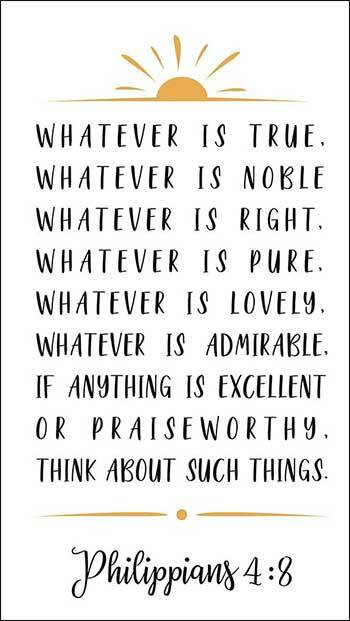 Sometimes we just need to reevaluate what we are filling our minds with, and do a little adjustment. We must remember, what comes in, will certainly come out.